February is officially here! Time to kick off the parkas and sweats. Wearables from the Stocking Stufftacular are sooo last season. It's time for Valentines Day outfits! We're here to share some looks that are fun and fashionable for users with both NC and NP budgets! First, let's look at some lovely NP outfits your Neopets can wear for this special day! This outfit is "so totes adorbs!" There's a nice purple theme that ties to fance top in with the background and the flowers. 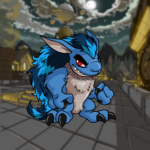 I think this is great for male Neopets, and also cool female pets! This is a nice alternative for bright pink customizations with hearts flying everywhere, too! I couldn't find an item for the right hand that is NP only, so if you have some NC stored up you should look at some items to add a nice finishing touch. Okay, so this might be cheating using a pre-made outfit. But nothing says Valentines to me like CHOCOLATE *nomnomnom*!! The background and foreground are obtainable from Chocolate Treasure Chests, which you can sometimes snipe for good deals. This will save you some NP in buying those items. I think this is a fun, out-on-the-go, day time outfit. It is bright, pink and red, and so happy! If I were out running errands or going to lunch with friends, this would be a great outfit! Outfit #3 is a day outfit, so naturally Outfit #4 is the night outfit! This is more expensive- you can find some cheaper substitutes if you'd like. This is a great outfit if your pet has dinner plans on Valentine's Day in the Lost Desert- how exotic! You can also substitute and use the Slushie Slinger Waitress Wig for some added volume and a touch of class! Now let's preview some NC looks for this holiday of love! This outfit is so awesome, I just love the gothic items here! The wig has a nice highlight of deep scarlet that matches not only the dress and necklace, but also the flowers in the background. I love when there's a color that unites an entire customization! There are also lots of items you can switch up since there are so many options available to you! The Dashing Gothic Jacket is great for pets that aren't fans of dresses. If your pet thinks umbrellas are stupid if it isn't raining, how about a Gothic Black Rose Bouquet or Gothic Lily Bouquet? If you like garlands, you can use the Gothic Heart Valentine Garland instead of a foreground to spruce it up a bit. The Gothic Tiara is a nice touch for owners who dislike wigs. The cool thing about gothic items is that there are quite a few specie wearables that you can buy with NP if you are low on NC. Korbats, Nimmos, Rukis, and Wockies all have cool wearables that bring a little something different to your customization. This is such a cute outfit, I love it! It is like your Neopet is hiding in a card to surprise someone and be their mysterious valentine! The face is nervously hidden behind the mask- just waiting for the time to reveal his or her identity! How fun would it be to dress up like this and send A Mysterious Valentines Card?! It's like a little baby cupid! Hopefully you thought ahead and bought the new wings when they were on sale recently! They complete this outfit and really tie the Cupid theme with the bullseye in the foreground. You could substitute the Delicate Valentine Heart background in if you like more red in your customization! Even True Love needs a warrior to protect her! This outfit is so perfectly matched with pink and gold, from the tip of the wings to the tip of the horns. The sword and shield create a nice theme, and you could always play around with those items a bit if you don't like garlands or random foreground objects! This is the definition of Valentine's Day! Everything screams red, love, and hearts! Still, you could always kick it up with the Delicate Valentine Heart Background! Outfit #10- The Valentine Delivery Neopet! What would Valentine's day be without someone to deliver Valentine's to everyone! For this outfit you need: Valentine Delivery Dress, Valentine Delivery Bag, Valentines Day Mailbox, Tunnel of Trees Background, Valentine Delivery Wings, Valentines Delivery Hat. This Neopet is helping others on this special day, ensuring everyone feels loved and happy on this holiday! Remember to spread some cheer yourself, and you'll be just as lovely as your Neopet!